Scattered showers and thunderstorms remain in the forecast early this week, but activity may relax a little bit by Thursday and Friday. Today and Tonight: Your Monday will bring a better shot at showers and thunderstorms than Sunday. After a partly sunny and steamy start to the day, activity will bubble up for the late morning and afternoon hours with rain coverage around 50 percent. Highs will top out near 91 degrees. Overnight will be partly cloudy and muggy with lows in the upper 70s. Up Next: Rain coverage is expected to decrease this week with just “isolated” showers and thunderstorms for most days. Tuesday and Wednesday present a better chance of “scattered” showers and thunderstorms, however the rest of the week looks drier. Temperatures will not fluctuate very much through the week. In fact, afternoon maximum high temperatures have been slightly below average of late, but will recover to near average on days that feature less rain. 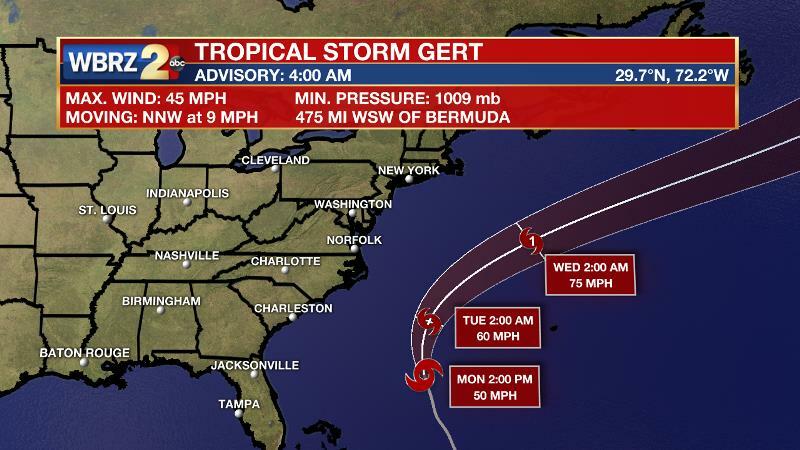 The Tropics: Tropical Storm Gert has formed. While the storm could become a hurricane by the middle of the week, it will not affect the United States. Gert will move due north between the U.S. and Bermuda and then out to sea thanks to an upper level trough. Another tropical wave off of the African Coast has a 50 percent chance of further development through the week. A fairly typical summer weather pattern will prevail through the forecast period. Weak ridging aloft across the Gulf Coast may be suppressed somewhat over the next couple of days as an upper trough swings through the Great Lakes and into the Northeast region. This may allow for better convective coverage Monday and Tuesday than Sunday. Diurnal heating will drive showers and thunderstorms with lake and sea breezes as well as any outflow boundaries serving as a focus for development. The mid to upper level ridge is forecast to build somewhat over the central Gulf for the second half of the week. This, along with some drier air pushing into the region, should result in more sparse convective coverage during that time. The upper ridge will then weaken and shift westward next weekend as a deeper upper trough translates east across the country. Higher rain chances will then be in order again for next weekend.